A number of our chaplains and special friends have written books or contributed to major literary works and other media. This page is dedicated to identifying these works and giving the website viewer a way to learn more about the medium and how to order it. “This Survival Kit is a clearly established and rare manual resource for teaching and training CPE students. The author, Dr. Brenda P. Wallace, offers a succinct history and philosophical/theological framework, including a SMART Goal paradigm, which practically facilitates students in navigating the step by step clinical and didactic processes. 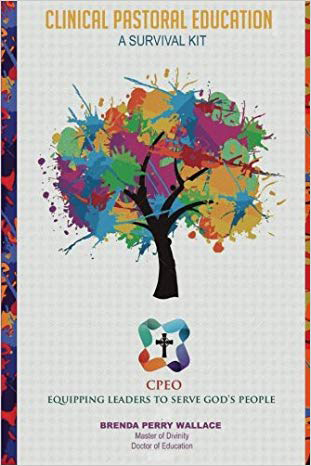 I heartily endorse this CPE resource and consider it a requirement that every clinical pastoral education supervisor and student should possess.” —Dr. Thomas Louis Brown, Sr., ThD. Bishop, Christian Methodist Episcopal Church Rev. Brenda Perry Wallace received a Doctor of Education from Richard W. Riley College of Education and Leadership from Walden University in Minneapolis, MN. Her dissertation entitled 'Perceptions of Lived-Experiences of Clinical Pastoral Education Students.' Four themes that emerged from this study were: a) Personal Empowerment; b) Increased Sensitivity to the Suffering of Others; c) Improved Competencies in Pastoral Care; and d) Connectivity to Self-Care and Ministry. She has worked as an engineer at National Aeronautics and Space Administration (NASA), as well as twenty years as an engineer, project, and product manager with BellSouth, now AT&T. She was ordained as an American Baptist minister in 1998. Rev. Dr. Wallace currently serves as the secretary to the Southeast Region of the Association for Clinical Pastoral Education (SERACPE). She enjoys being a part of the National and Regional ACPE Accreditation committees, and has served as an Accreditation consultant to CPE Supervisors and ACPE centers preparing for ACPE Accreditation Reviews. Brenda Wallace is a CSC CPE Educator and author. Discussions about leadership, even those centered on women, often overlook contributions made by Asian and Asian North American women. 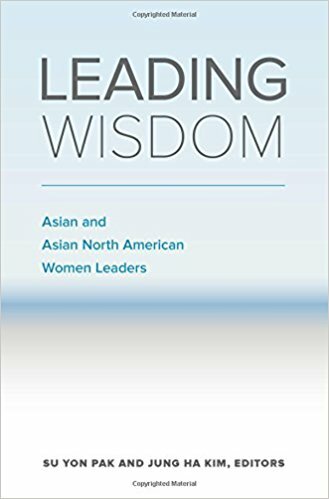 Now, Su Yon Pak and Jung Ha Kim share stories of Asian and Asian North American women who found their ways, sometimes circuitously, sometimes unexpectedly, into leadership roles. Divided into three sections—“Remembering Wisdom,” Unsettling Wisdom,” and “Inciting Wisdom”—the book presents narratives of leadership experiences in the fields of social activism, parish ministry, teaching, U.S. Army chaplaincy, religious history, Christian denominational work, theology, nonprofit organization, theological social ethics, clinical spiritual care education in healthcare systems, and community organizing. Leading Wisdom challenges conventional understanding through its creative reimagining of what it means to lead. Lt. Roger Tharpe's journey through the desert is for those seeking another kind of military story, a contemporary look from one soldier’s perspective of how God sustained him through all tribulations. Small enough to fit into a soldier's pocket, this journal will provide hope and comfort for our military's soldiers and their families. Lt. Tharpe says, "It is my desire that after reading my journal entries during the intense fighting of the war in Afghanistan, you will walk away knowing that you have heard from a soldier — but not just any soldier — a soldier who loves the word of God as well as his brothers and sisters in Christ. I hope you will feel their struggle as well as mine, weep with them that weep, and enjoy the victories we have in Jesus. It is also my desire that you learn what it means to love and speak to others about Jesus, that fear would not overtake you because of differing worldviews, but that you will hear the chant of victory in Jesus’ name." "I am about to do a new thing; now it springs forth, do you not perceive it? I will make a way in the wilderness and rivers in the desert." (Isaiah 43:19) If there was no fear of failure, what would you do with your life? What dreams are you afraid to dream? What is holding you back? What event in your life has prevented you from moving forward? "Moving Forward" will help you to understand how as human beings we allow our pasts to dictate our futures unnecessarily and prevent us from moving forward to be all that God wants us to be. This book was written with the goal of helping people get beyond the guilt, pain, and trauma of the past in order to live a life beyond what we could have ever imagined. The trick is to change your thinking. By using Biblical principles, "Moving Forward" will teach you how to recognize those wrong thinking patterns as well as teach you how to confront the demons in your life that are holding you back. If you are ready to become unstuck in life and become the great person that you are destined to be, then I invite you to journey with me through this book. I believe it will not only help you move forward, but it will also help you to be more than you ever thought possible. Let's move forward. Culture shapes how people understand illness and death, but few studies examine whether acculturation influences patients’ end-of-life treatment preferences and medical care. The USAS is a reliable and valid measure of "Americanization" associated with advanced cancer patients’ end-of-life preferences and care. USAS scores indicating greater caregiver acculturation were associated with increased odds of patient participation in cancer treatment (chemotherapy, clinical trials) compared with lower scores. Future studies should examine the effects of acculturation on end-of-life care to identify patient and provider factors that explain these effects and targets for future interventions to improve care (e.g., by designing more culturally-competent health education materials). This is the first comprehensive resource for spiritual and pastoral care--a vital resource for clergy, seminarians, chaplains, pastoral counselors and caregivers of all faith traditions. It integrates the classic foundations of pastoral care with the latest approaches on spiritual care. It is specifically intended for professionals who work or spend time with congregants in acute care hospitals, behavioral health facilities, rehabilitation centers and long-term care facilities. 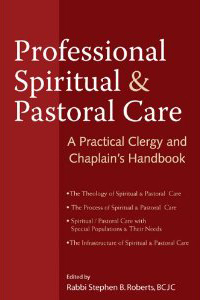 Offering the latest theological perspectives and tools, along with basic theory and skills from the best pastoral and spiritual care texts, research and concepts, the contributors to this resource are experts in their fields, and include eight current or past presidents of the major chaplaincy organizations. Additionally a good review of this text can be viewed at: Ministry Matters. Two CSC chaplains were contributors to this text. Finding sustainability for pastoral presence in corporate for-profit healthcare can be a challenge for pastoral care directors. In the midst of corporate acquistions, mid-level managers often become the stabilizing element for staff as corporate shuffling takes place. In this book, many culture challenges stemming from corporate acquisitions have been addressed and solutions explored as the author shares his extensive experience setting the sails of sustainability for pastoral care and presence in corporate run healtchare. This book is a must read for corporate or not-for-profit hospital CEO's, COO's, CNO's, ECO's, Director's of Pastoral Care, staff Chaplains, mid-level health care managers and hospital employees. CJ Malone is a CPSP CPE Supervisor endorsed by The Coalition of Spirit-filled Churches. Praying the News, co-written by Wendy Griffith of CBN News, will be released on September 11th for the tenth anniversary of the 9-11 attacks. In Praying the News, concerned readers will find a practical guide to discovering the power, joy and peace of partnering with God. Veteran news reporters Wendy Griffith and Craig von Buseck offer an unvarnished assessment of the media as well as a comprehensive biblical plan for effective, world-changing prayer. They tell behind-the-scenes stories not only of effective prayer for the news but also stories of their prophetic intercession while reporting the news. Bad news is no match for the Good News of God’s kingdom! This purpose of this Manual is to assist us with understanding Spiritual Fitness as “being right” with God, with others and with oneself. “Being right” means that we are “who” we should be at any given moment in time, that we are true to our own values and convictions, and that we seek to positively grow and mature as members of our military community. “Being right” indicates that we are comfortable and at peace within ourselves, that we are satisfied with our personal participation in the many relationships of life. This satisfaction includes having peace with God. As service members continue to fight the War on Terror, many are reflecting on the military oath that they pledged to keep. Four words ultimately transform American citizens into Soldiers, Sailors, Airmen, Marines and Coast Guardsmen. Bohlman, a veteran, considers the importance of the military oath, examines the power of faith in times of conflict, and helps prepare military members and their families for the challenges of their service commitment. It is an excellent resource to inspire the troops for service and preserve the core values of the U.S. Armed Forces. Special Features: Appendix section includes reference resources such as a list of all U.S. Military Oaths, the Code of Conduct, the Will to Survive, the Flag Folding Ceremony, and much more. Also contains end-of-chapter reflection questions that make it a great tool for individual and small group studies in an academic setting or a deployed environment.